This year the Freeze Festival moved to Clapham Common and included five days of alpine food stalls, apres ski bar parties and a ski and snowboard cinema as well top music acts. But it was be the winter sports athletes who will really stole the show in the Hail The Rail competition. Essential Travel caught up with three winter sports pros at the Freeze Festival Press Day. Thirty year old Julian Ball will be entering the 'Hail the Rail' contest at the Freeze Festival Saturday 30th November. Julian is one of those rare breeds that started off as a snowboarder and then took up skiing and is now a semi professional sponsored by brands like Ellis Brigham. Julian starts by confessing that he didn't always wear a helmet. "When I started boarding, I didn't wear one, no. My parents wanted me to wear one as a teenager and it was an easy way to rebel but I quickly realised the severity if anything happened to me. I've had a couple of bad concussions even with the helmet on. In fact, one even cracked in three places, so I always wear one now, just for peace of mind. I now also wear Impact shorts sometimes and also a back protector, especially if I am doing big jumps, as it keeps my mum happy. But they can get quite hot," he laughs. "I've had a couple of bad concussions. In fact, one helmet even cracked in three places, so I always wear one now, just for peace of mind"
"I remember that I did a video shoot a few years ago wearing just a cap and t shirt, and no safety gear. My mum stood up after 15 seconds and said she couldn't watch me ski without a helmet." Julian laughs again when we ask him about good luck rituals. "Every year I get a new pair of skis and one has to be the right and one the left. If I get it wrong I have to change them over without people seeing, even if I am at the top of the chair lift! Julian's advice for new skiers is not to rush it: "Enjoy steady progress and small steps. Don't jump ahead of yourself: push your limits and you push your luck. There are a few examples of people who are ridiculously talented, Billy Morgan for example, but most of us need to pace ourselves and stick within our limits." His training for the Freeze Festival is intense. "I do a lot of other sports such as tennis and squash and I can play these four to five times a week as they are important for agility and fitness. I try to keep happy and enjoy myself as a happy open mind is easier to ski with! Oh, and I play football too!" " I think there are some slopes in the US where they boarders and skiers are segregated, but I don't see this being a constructive way forward at all"
"I don't think it's good to have a divide. We are all there for the same rush and to be part of the same community. I can see why beginners might think that: snowboarders make a horrible noise when they come up behind you and the runs can get very rutted. Boarders are not being malicious at all. I think there are some slopes in the US where they are segregated, but I don't see this being a constructive way forward at all." 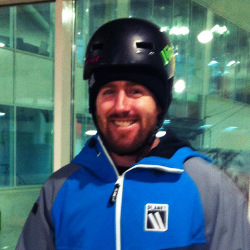 Billy Morgan is the World No 2 slopestyler and winner at the Freeze Festival in 2012. Last year, he became the world's first snowboarder to perform the Triple Rodeo when competing in Colorado in the US. 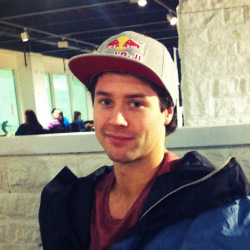 Billy, 24, fell in love with snowboarding when he went on a school trip when he was 14 years old. He soon began entering local dry slope comps and entered the British Championships in 2009 where he won gold. Billy is in the running for Team GB for the Winter Olympics next year. "I would get a back protector for backcountry boarding as they are good for unexpected knocks"
Unlike Julian, Billy has always wore a helmet: "The only time I might not is if I am getting from A-B, for instance, going for lunch, and have left all my gear in a pile to come back to. I also used to wear shorts but now my leg muscles have become strong and they are my shorts! I would get a back protector for backcountry boarding as they are good for unexpected knocks. But the best protection is lots of warming up and stretching before I start. Mind you, I always get nervous before a competition and need to pee!" Billy's tip for new boarders is simple: "Don't go off piste unless someone is with you and always follow the guidelines." Unfortunately Billy didn't compete in the Freeze Festival this year due to an injury but he tells us he's is still riding as much as possible, as well as keeping his muscles worked out with trips to the gym for strength and keeping flexible. Finally, when we told him about our survey, Billy was a little sceptical that it would be practical to separate skiers and boarders on the slopes: "It might make sense for beginners but once people are advanced they tend not to get out of control. I think it would be pretty hard to implement, unless a resort has a lot of extra space." Katie Blundell is a professional Snowboarder from the UK. 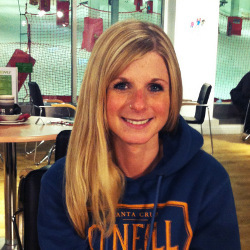 Having skied from a very young age and looking for a fresh challenge Katie got into snowboarding at the age of 21. Since then she has travelled the world competing at some of the top winter sports events. Katie came 1st in Slopestyle at The British Championships in Tignes 2013 and 1st in Slopestyle at the Freeride Series, Thredbo 2012 and will be competing in the Battle of Britain challenge at this year's Freeze Festival. When she is not snowboarding, Katie enjoys Yoga, Zumba classes and Pilates. Katie is a big supporter of wearing helmets: "I am very big on helmets. I didn't wear one when I started but was within a year after a couple of knocks. I've been wearing one ever since and am very grateful for it. I also wear knee braces on both knees and an arm brace as I have hyperextending joints - my elbows can bend backwards if I fall on them. I used to wear bum pads too but stopped because I thought they made my bum look big! "Wear a helmet!" is her tip for new boarders. "Also, be aware of everyone and everything going on - try to have eyes in the back of your head. Oh, and most important, learn to stop. It's vital." "Wear a helmet!" is her tip for new boarders. "Also, be aware of everyone and everything going on"
Surprisingly Katie's training for the festival doesn't involve as much snowboarding as you would think: "I live in Devon where there's obviously no snow and only a dry slope like a toothbrush with grass growing between the bristles! What I do do is a lot of pilates training to build up muscles and core strength, and I also run. But my basic schedule is usually 6 months of working followed by 6 months of snowboarding. Finally, Katie was the most taken aback on our pros when told about the survey results called for skiers and boarders to be separated on the slopes. "There is this odd hatred of borders amongst some skiers. Boarders just don't tend to feel the same way. I don't know here it comes from but it's sad and I think would cause even more problems to split them up." All of our pros take safety very seriously indeed, and invest in the right gear to keep them safe. Any winter sports enthusiast, from beginner right through to experienced, should do the same, and the first step is getting the right winter sports travel insurance.